10 sprays delivers a minimum of 130mg (38% RDA) of optimally absorbable elemental magnesium. BetterYouTM Magnesium Oil Recovery Spray combines magnesium chloride with grape seed, lemon, camphor and black pepper essential oils to help maintain muscle and joint health. BetterYouTM Magnesium Oil Recovery Spray efficiently replaces magnesium lost through sweat and the increased metabolism of exercise regimes. Magnesium is the single most important mineral to sports nutrition that no serious athlete can afford to overlook. Formulated for topical use, essential magnesium is absorbed directly into the skin tissue, entering the cells immediately. Camphor, black pepper and lemon oils have been added to stimulate blood circulation to the area and encourage muscle detoxing. Can be applied to any area of the body. Use before, during and after training. Use before exercise to aid warm up and flexibility and after to help replace magnesium through sweat and the increased metabolism of physical exertion. Apply 3-4 sprays in each muscle area and massage in well. 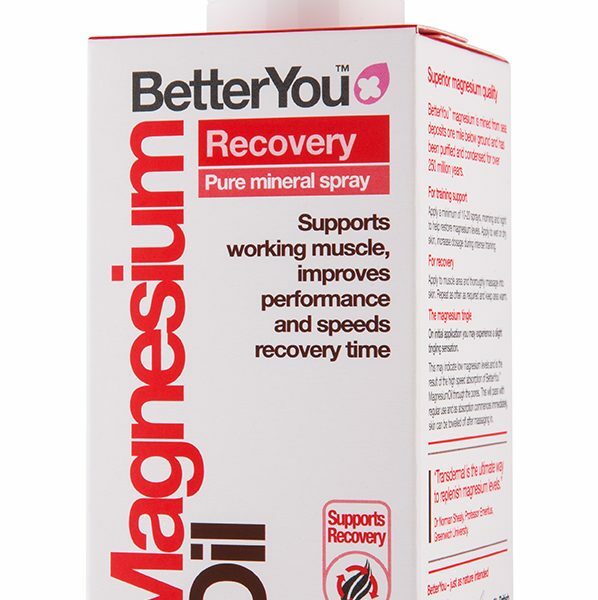 BetterYouTM Magnesium Oil Recovery Spray is suitable for anyone from 12 years of age. For children under 12 we recommend BetterYouTM Magnesium Oil Original Spray which does not contain essential oils. For the same reasons, we also recommend BetterYouTM Magnesium Oil Original Spray for during pregnancy and nursing.